Recently I updated my Samsung BlackJack to Windows 6 Mobile, ( to backup I had to setup ActiveSync, Samsung Modem Device Drivers, Outlook ) only after which I could backup and connect my device.If you have a Android Device it’s a lot more easier to manage your device, it would require a WiFi Connection and the AirDroid App installed on you Android Device and you are ready to browse through your phone via Web Browser. 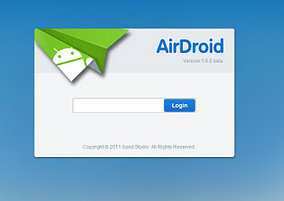 Next Start the AirDroid App on the phone ( this should show the dynamic password ) which should be entered in the PC WebBrowser to access the device. Start the WebBrowser, and enter the URL which should show the login, enter the Dynamic Password Generated in the previous step. You should now be shown the AirDroid Web Desktop. A predefined password can also be set instead of a dynamic password for each connection, but make sure to keep this password strong coz If you are on a shared Wireless Network you could risk leaving you phone open to access. How To Create Strong Password and Easily Remember Them Using Password Card.